The Gaden Shartse tours have been visiting the United States since 1989 with a two-fold mission: to be of service to the world by helping to spread peace, compassion, and tolerance through cultural exchange, interfaith dialog, and Buddhist teachings while also raising funds to support the education, medical needs, housing, and building maintenance for the Monks at Gaden Shartse Monastery, located in a Tibetan Refugee Settlement near Mundgod in South India, www.gadenshartse.net. Gaden Shartse Monastery is the original Buddhist monastery of the Gelug tradition of Tibet, the same lineage or tradition as His Holiness the 14th the Dalai Lama, Tenzin Gyatso. According to Tibetan Buddhist tradition, the creation of the monastery was prophesied by the Buddha 1900 years prior to its actual establishment in 1409 CE. The monastery was housed on a large hillside about 30 miles east of Lhasa, the capital city of Tibet with a population of 5,000 Monks. The original monastery in Tibet was destroyed in 1959. It was re-established in southern India by only 48 surviving Monks. The Indian government generously donated land for a Tibetan refugee settlement, including Gaden Shartse Monastery. It has taken incredible effort in the face of unthinkable challenges to keep this precious unbroken tradition of Tibetan Buddhist teachings and culture alive over time. The Roaring Fork Valley has a unique connection to Tibet and her people with the original monks sent out into the world by His Holiness the Dalai Lama were received locally by John Denver and the high mountain terrain reminds Tibetans of the Motherland. 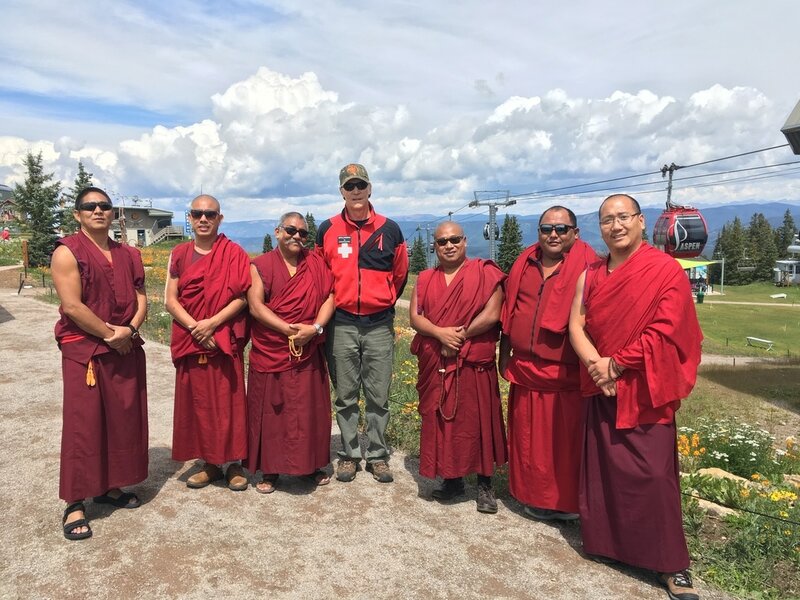 Visiting Monks and Nuns from Gaden Shartse have been able to make Aspen, CO their home away from home due to the tremendous generous and warm reception the community extends. Locally facilitating visiting and resident Monks and Nuns in Aspen is Serene-Marie Washburn and a kind community of volunteers and donors. If you are interested in participating as a member of support as a participant, volunteer, or financial donor, please contact aspentibet@gmail.com. General information, questions, and interest are also welcome.